Posted: Tuesday, November 25, 2014 10:08 am | Updated: 6:25 pm, Sun Nov 30, 2014. Left to right: Brian, Penny, Chris Boehm (Owner, Burger 55), Tracy (Kevin’s Job Coach), and Kevin. Burger 55, a custom gourmet burger restaurant located in Penticton, BC, has seen much success since opening in 2009. They have been featured on Food Network Canada’s “You Gotta Eat Here”, and recently moved into a larger location where they employ approximately 15 staff. 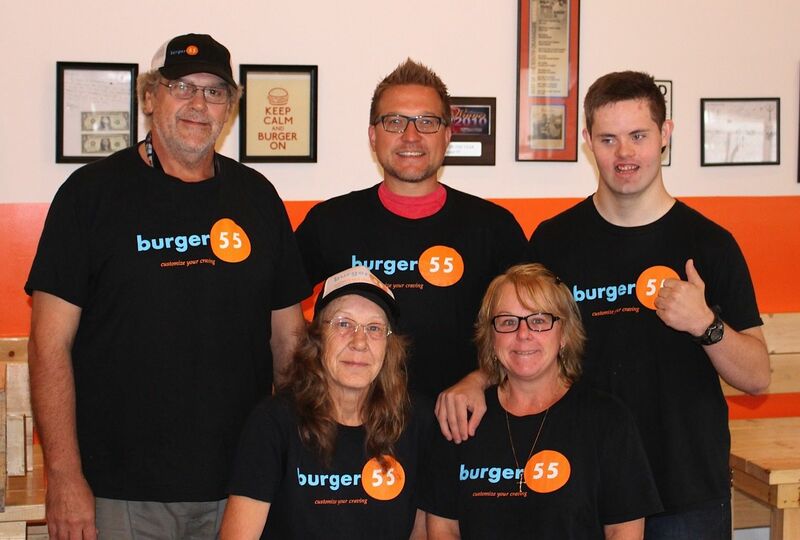 “I always wanted to incorporate people with disabilities into my business and give them a chance”, says Chris Boehm, the owner of Burger 55. With the help of the Neil Squire Society and their Working Together Program, a wage subsidy employment program for persons with disabilities, Chris has done just that by hiring Penny, Brian, and Kevin. Brian has a brain injury sustained in a car accident in 2000, osteoarthritis, chronic obstructive pulmonary disease, and celiac disease. “For eight years, I had to pick bottles and cans to make ends meet, to survive, until I found the Neil Squire Society,” he tells us. Brian took part in the Society’s Employ-Ability Program before joining the Working Together Program. Brian was seeking a job that suited him and his skill set. He found it at Burger 55. “I share janitorial duties with Penny,” says Brian. “My work consists of mopping and sweeping floors, bathrooms, the office and outdoor patio. Making sure the front of the restaurant is clean for customers,” says, Brian “I enjoy my work. I look forward every day to doing my part of making Burger 55 a great experience for the customers and for myself.” Brian is a “hard worker. He doesn’t put up with any nonsense and I can trust him with the business,” Chris tells us. Chris provides Penny, Brian, and Kevin with the flexibility they need due to their disabilities. “Chris has been great. He gives us a choice of what time of day we can work,” says, Brian. “If I take longer to do what I need, it’s ok,” agrees Penny. “I feel safe and comfortable in my work environment,” adds Kevin. “If a day off is needed, it’s accommodated. There’s no discrimination, only a welcoming team environment. I feel that I can be myself and humor is welcomed.” he says. “Both Penny and Brian always represent the business in a positive manner,” says Chris. “Kevin sure likes to talk and tell stories but he’s a hard worker as well and gets the job done”, he says. Penny, Brian, and Kevin have benefitted greatly from their jobs at Burger 55. “I am able to buy better foods to eat healthier,” says Penny, when asked how employment has impacted her life. “Also, I’m able to treat my grandchild to outings and gifts”. Brian shares a similar sentiment, “this job has helped with my mental health and financial status. I don’t have to starve now, because gluten-free food costs a lot, and my bills are now paid on time.” Kevin agrees, “I have money to buy things I couldn’t afford before. I am very proud; I feel better and have improved self-worth. Chris, the owner is awesome. I feel that I am a valuable employee,” shares Kevin. Colin Cousins is grateful for the owners and staff at Cedar Opportunities Co-op Cafe for the opportunity to develop his work skills and become an active member of his community. Cousins, who has a developmental disability, was hired part-time by the co-operative, also known as the Coco Cafe, when it opened three years ago. The co-operative workplace was created as a community coffee shop that also gives local residents with development challenges on-the-job skills training. Cousins works two days a week wiping shelves, doing dishes and helping with the catering end of the business. He said he learned about the Co-op Cafe and its employment opportunities while attending a day program sponsored by the Nanaimo Association for Community Living, which is committed to removing the barriers faced by individuals with developmental disabilities. Coco Cafe was founded by a group of families in the Cedar area, all of who have adult children with developmental disabilities. It currently has a staff of 10, some full time and others part time, that have development disabilities and often experience a substantial shortfall in support services and employment opportunities in the community. Manager Melanie Cadden said the business is in the process of developing a new three-month work experience program for its new staff. She said that while some of the participants in the program will likely be kept on after they are trained, the rest will have a good reference, work experience and help developing a resume in their efforts to find other employment after they complete the program. “We have no sources of government funding and we figure the program will cost the business an additional $4,500 in costs, so we’re hoping the public will help by donating to help out and/or by sponsoring some of the new employees,” Cadden said. Concern: I have been told that my son / daughter is not ready to work in the community. Answer: Customized employment eliminates the need for a person to “get ready” to work. If your son / daughter wants to go to work, then it is time for him / her to go. A key aspect to customizing employment is finding work that matches your son’s / daughter’s interests and skills. Using this approach, an employment specialist or job coach works closely with a job seeker to negotiate a specific position that uses the person’s talents to match the needs of a business. The goal is not just to locate any job, but a job specifically negotiated that capitalizes on your son’s / daughter’s interests and abilities. Concern: But, my son / daughter does not have the skills to meet the demands of a real job and needs training. Answer: Many people with significant disabilities do not transfer skills learned in one setting to another such as a workshop to a community business. One of the reasons is that it is difficult to simulate the features of a job in a setting that does not have coworkers and the demands of a real workplace. For instance, your son / daughter may be in a training program to learn how to work in an office. The participants in the program take turns completing tasks such as sorting mail, delivering messages, folding letters, and stuffing envelopes. However, typical position descriptions change from business to business. The way that one office prepares and delivers mail can be very different from another. The time spent learning the task in the training program would be better spent in the actual workplace where your son / daughter is employed. Concern: The day program is a safe place, and I don’t think my son / daughter should be alone in a community job. He / she has never been without the support of the agency’s staff. Answer: Looking for a “safe” place to work is also part of the customized employment process. First, “safe” needs to be defined in relationship to your son’s / daughter’s support needs. For example, a person who has a history of walking out of any door at home or the day support may have a very different safety concern than the person who just lacks community based experiences. In some instances a workplace that limits access to the outside or machinery may be warranted. Another person may just need to have a little extra support from a coworker. Your safety concerns will be taken into consideration when negotiating work. It is only natural for you to be concerned about your sons or daughter’s welfare. For example, part of the negotiations might include arranging for some additional supervision or creating a job where your son / daughter works alongside a coworker who is aware of the support need. Once again, a job coach would work closely with an employer to negotiate a job that minimizes your son’s / daughter’s disability and provides the workplace supports necessary for him / her to be successful. Concern: How would my son / daughter learn the skills in the workplace? Answer: Key to the negotiation process is the employer’s willingness to support whatever your son / daughter needs to become successful at work. For example, sometimes a job applicant with a disability will need more skills training than the employer is able to provide. In such a case, a trainer sometimes called an employment specialist will go to work with the individual and provide additional on-the-job training. Or perhaps, the person needs to use an assistive technology device to get the job done like using a reaching device to pull items off of a high shelf. Another job applicant may need a modification in a company’s policy that would allow him / her to work a flexible schedule. Workplace supports vary from individual to individual and are tailored specifically to meet the needs of an individual in a customized job. At the end of the process, when the deal is struck, the result is a custom made job for your son / daughter. Concern: I don’t know what kind of job my son / daughter would like. Answer: A job coach or employment specialist will spend time getting to know your son / daughter as well as your family. For instance, an employment specialist may spend time with him / her in the community doing preferred leisure activities, talking with family members, meeting with friends who know your son / daughter well, and so forth. The time will be spent discovering his / her interests, abilities, and support needs. Occasionally there still may be uncertainty about what your son / daughter might like to do. If this happens, several types of jobs will be identified that appear to match your son’s / daughter’s expressed work interests. Then, he / she can have a brief work experience; perhaps 3 – 4 hours within each job type, to more specifically identify his / her work preferences and support needs. This information will be used to customize a job on your son’s / daughter’s behalf. Now prepared, the personal agent or employment specialist will begin to identify potential places of employment in the local business community. You may even be asked if you know employers in your network that would be willing to support a person with a disability in the workplace. The agent will meet with employers to learn more about the business and specific needs of the company. Whenever an employer has some suitable opportunities that match your son’s / daughter’s specific interests and needs, the job negotiation process will begin. A good customized job individualizes the employment relationship between employees and employers in ways that meet the needs of both. A proposal will be prepared for the employer’s consideration that will highlight your son’s / daughter’s abilities and how he / she can bring value to the business. Once a proposal has been made and both the job applicant and employer agree to the proposal, a work start date will be set. Concern: How will my son / daughter get to work? Answer: A critical aspect to customizing a job for your son / daughter will be finding work opportunities at locations where transportation will not present a barrier. Every situation is different. For example, some people may travel to work using public transportation, while others, ride with co-workers, take specialized transportation services, or walk. There is a Compass card available for $45 per year that entitles them to ride the bus. Part of getting to know your son / daughter will be exploring various transportation options. This information is vital to the strategic plan for customizing employment, since it influences the scheduling requirements and the work location. For instance, your son / daughter may have access to the public bus system, but lack the skills needed to get to the bus stop and ride the bus alone. In this case, a trainer can teach your son / daughter how to get to and from the job on the bus. Or, another option might be that the place of business is on a friend’s route to and from work. This could become part of the employment negotiation process. For example, employment negotiations may center a round a specific work schedule that would allow the person to work a schedule that matches the friend’s daily commute times. If you are not comfortable with these options, we can determine if there is a specialized transportation service in the community that can offer door-to-door service. Or, perhaps a college student or senior citizen would like to earn extra money providing transportation. You can be assured that the support needs of your son / daughter will be met so that everyone feels comfortable. He / she will not be left alone until the skills to get to and from work independently have been demonstrated. Concern: But, that would cost extra money. I don’t imagine that he / she would be making very much anyway. Answer: Your son / daughter would be making at least minimum wage or more based on what other workers earn who are performing similar job duties. The amount would be negotiated with the employer at the time of hire and again during the course of employment for pay raises. Concern: Well, that raises another serious concern! My son / daughter can’t lose PWD benefits and Medical/ Dental. The reality is that he / she needs the benefits and health care coverage. Answer: if your son / daughter is receiving Persons with Disability benefits (PWD), he / she would be able to make $800 per month before any deductions from PWD, then it would be reduced dollar for dollar for how much they earn. Just as if you were receiving Employment Benefits and were working, but less than before and you would have it deducted from your EI. Once your child is approved for PWD they can always go back on their PWD if they lose their job. They are eligible to keep their medical and dental as long as they don’t get benefits from their job. Concern: My son / daughter has friends in the extended employment program. Going to work would mean losing those friends. Answer: If the opportunity to make friends is important to your son / daughter, then this along with other key information would be taken into consideration during negotiations with employers. Every workplace culture is different. For instance, some are friendly and others are not. To understand the workplace culture, the person representing your son / daughter would ask the employer questions and look for signs that the workplace is friendly and supportive. For example, employees who appear to be enjoying their jobs may signal a pleasant place to work. Developing a good fit between a person and the social characteristics of a workplace is as important as learning how to perform a job. 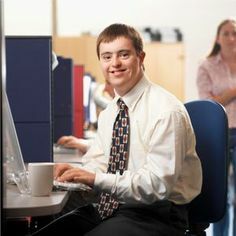 Many people with significant disabilities report making new friends at work and an overall, satisfaction with employment. Your son / daughter would have support establishing relationships with coworkers. Social activities that are available to other employees would also be available to him / her. Going to work also does not mean that your son or daughter has to give up friends from the workshop. They can still socialize outside of the workshop setting. Working should expand his / her social opportunities and not limit them. Concern: What if my son / daughter loses the job? Can he / she go back to the day program? Answer: Negotiating a customized employment opportunity for your son / daughter hopefully will prevent this from happening. Rest assured that staff will work hard to solve any problems that come up during employment and to address any support needs that could lead to job loss. This includes re-negotiations with the employer, if necessary, to further customize your son’s / daughter’s job. But, of course people still lose jobs. If this occurs, staff will work with your son / daughter to find a new job in the community. A new position will be negotiated based on what is learned in the first job about his / her interests, work skills and support needs. Remember, our program staff is always willing to talk with you whenever you have additional questions! Please contact us directly for more information on T-TAP. Modified for British Columbia by Dawn Robertson, Family Support Institute. Katie Jacobs , 14 Jul 2014 HR magazine UK. With an autistic son, ex-Walgreens SVP Randy Lewis was motivated to see how he could make business more inclusive . He talks about how to become truly diverse, and reveals his frustration that more companies aren’t trying. “Let me tell you a story,” says Randy Lewis, former senior vice-president at US retailer Walgreens, in a Texan drawl. And it’s quite a story. It’s the tale of how a man who led logistics at America’s largest drug-store chain, supporting it as it grew from 1,600 to 8,000 outlets with the most advanced logistics network in its sector, did so while giving job opportunities to thousands of disabled people. In Walgreens’ distribution centres today, an average 35% of the workforce comprises people with disabilities, and it has set targets to make sure one in every 10 in-store hires is also disabled. The model has been adopted and rolled out by British retailers including Boots and Marks & Spencer. 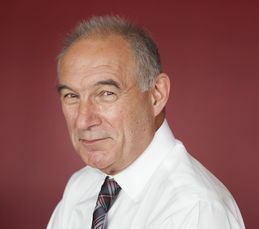 Walgreens had previously employed disabled people to do “ancillary rather than mission-critical work”, cleaning for example, but Lewis wanted to do something more. “We wanted an opportunity to bring people in as our own employees,” he recalls. That opportunity came with the building of a new distribution centre; larger and more automated than any the company had owned before. Lewis’s mission was to use that centre to allow the company to hire greater numbers of people with disabilities. It is now Walgreens’ most efficient site, and 40% of its workforce is disabled. Here, Lewis shares with HR magazine how he went about making his passion a reality, and what other businesses can do to become more diverse and inclusive of disabled workers. Retail is a notoriously competitive environment, with razor thin margins. When Lewis proposed his vision to the board, he knew saying he planned to invest significantly would not go down well with the shareholders. Lewis asked a friend who worked with autistic people how many typically-abled (to use the American term) employees he would need for each person with autism, in order to rely on peer coaching. The answer was two and the goal was set: hire one-third people with disabilities. Such a bold project has naturally led to processes having to change and rules alongside them. For example, when Walgreens looked into recruitment, it found people with disabilities had difficulties getting through the process, effectively excluding them from getting a job. “Finding the workforce was much more difficult than we thought,” admits Lewis. To overcome this, the company adapted its HR policies, allowing people to bring someone to help them fill in online interview questions for example, or permitting members of staff to bring a chaperone to counselling sessions if they need help understanding things. Walgreens agreed once it figured out the secret to making the inclusive model a success, it would give it all away, even opening its doors to competitors. Other employers often visit Walgreens’ centres to view the scheme in action, by working alongside someone on the floor. Walgreens doesn’t tell them whether the person they are matched with has a disability or not, emphasising the message of sameness.